From last week I was creating a Blog Planner in Canva and finally, it got completed. AND today I’m going to present it to you. 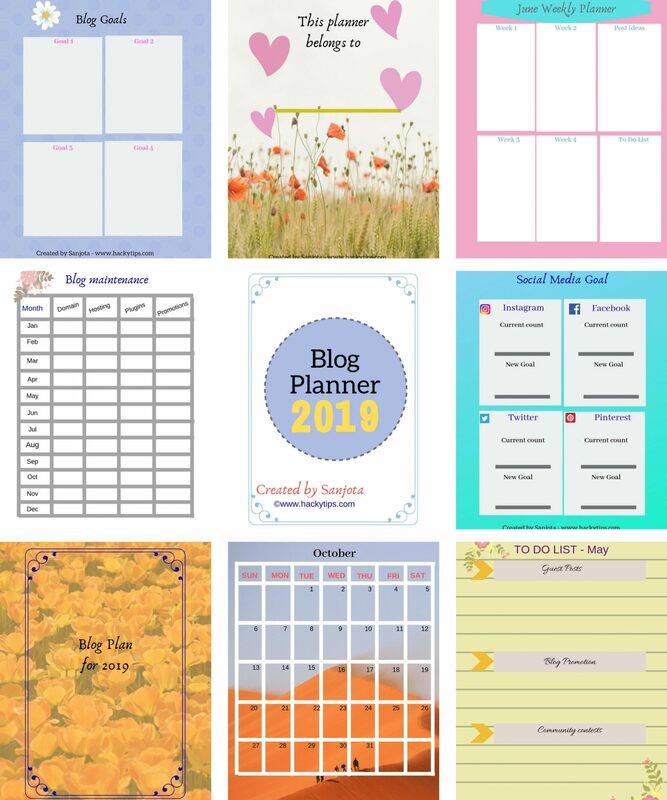 Also, you can Download free Blog Planner that I have designed. It took almost 4 days to design the Blog planner and one day to get it printed. I started this blog in April 2017 and it is almost one and half years to my blog. First 6 months were spent in creating, designing and writing good quality posts. I was consistent with the blogging which helped me to achieve good Alexa Ranking (<500k!) within a year. Last year was all about learning about blogging, getting to know other bloggers and being consistent. While everyone else was busy setting new year resolutions, I was thinking to do something (anything!) more with my blog. Along with all the things I did in 2018, I wanted to learn new tactics, SEO tricks, Pinterest growth, and a few other things. To achieve that, first I needed a planner to keep myself organized. I Googled to buy a good Blog planner but to my surprise, they were a bit pricy. As soon as it occurred to me, I opened Canva to check if I can plan Blog Planner in the free plan. Yes! 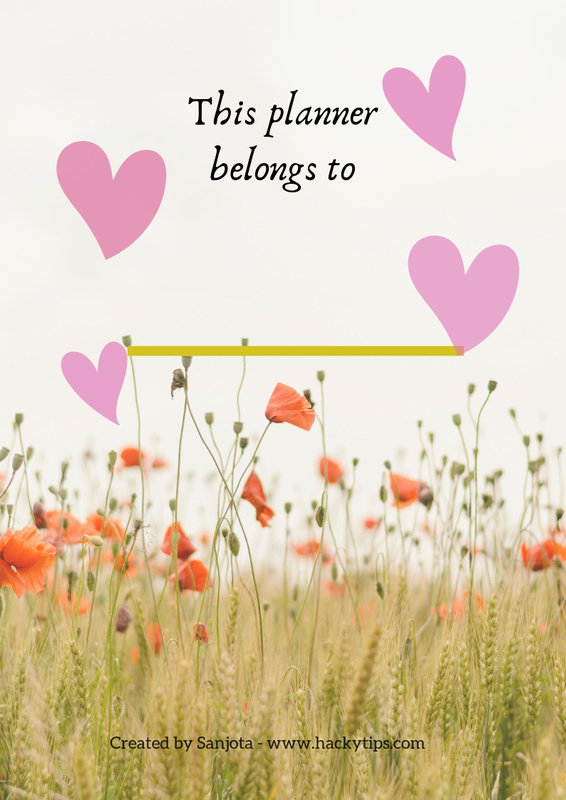 Canva allows you to create your own planner. That’s why it is one of my favorite. As already said, I spent almost four days creating this planner. And guess what? You have the option to download free Blog Planner now! Though Canva is free and full of creative options, it is difficult to spend time creating one. Hence I decided to give it for free to fellow bloggers. If you feel like you need one then download using the link given at the bottom of this page. Why I need a Blog Planner? Basically, I want to set some goals and achieve them by the year-end. To do that, either I can use my regular planner or e-planner or get a Blog Planner. Blogging is not easy. You need to be consistent in publishing new posts, promoting your brand/blog on social media, tracking analytics. learning new things about blogging and many other things. In the beginning, we will be very excited. As the days pass by, the interest seems to fade away especially when you are getting no audience. It is way more difficult for people who are blogging along with their office job. for them finding time itself is one of the challenging tasks. You need a constant push and motivation to be in this field. If you love it from the bottom of your heart then it is not difficult. But again it is more productive if you keep yourself organized. Hence I needed a Blog Planner. Recently I have been part of many blogging communities where there are ongoing activities on a daily/monthly basis. In order not to forget the last date or task, Blog planner is very helpful. How to design a Blog Planner? That was the first question I had when I started to design. Keep it in mind that Blog Planner should help you mark your calendar, note down Blog stats, Your weekly, and Daily planner etc. First, write down your requirements. Once I gathered that I looked for the available designs on Canva. Since there is NO existing design format for Blog Planner, we need to create one using custom dimensions. Once you open Canva, right side there Custom Dimensions button. As shown in the above image you can choose your own dimension. It comes in pixels, inches, centimeters, and MMs. 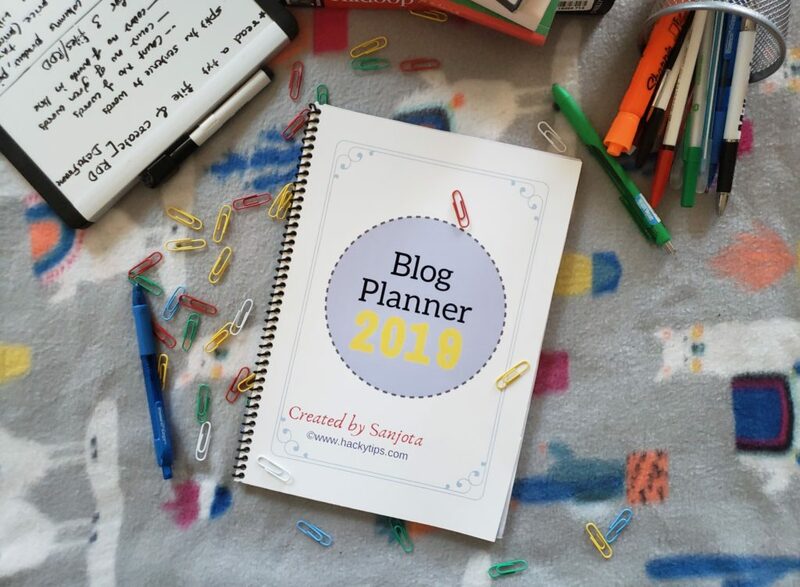 Next question that comes to mind is, what should be the size of a Blog Planner? I did my research again and found this website where they explain about different sizes of Planners. I wanted a big spacious blog planner, hence I choose the A4 size. If you want a portable or travel-friendly planner you can choose smaller dimensions. Now the floor is all yours. You can add up to 100 pages. There are hundreds of free backgrounds, fonts, and elements such as shapes, grids, lines, etc. There is an option to upload your photos in order to make it specific to your needs. What is there inside my Blog Planner? I know you cannot just click on ‘download free Blog Planner’ just by seeing the cover page. You want to flip through it, see how well it is designed inside. That is why I’m showing a few pages of my Blog Planner. Here is the quick sneak peek into my Blog Planner. Out of 62 pages, my most favorite page is ‘This planner belongs to’. That is where I will write my blog name in big bold letters. 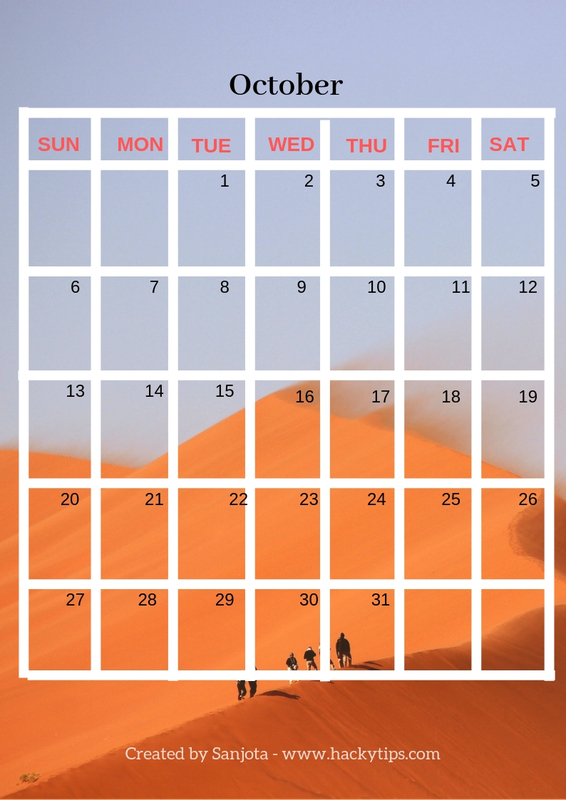 I have created a monthly calendar. I basically want to mark the days I have been worked on my blog. It helps me keep going and one day when I turn back my pages it shows how hard I worked on my blog. In this page, you can even mark last dates, dates when you plan to publish your post etc. It took a lot of time to create the calendar page. I had to draw each line and write the numbers inside. There is a Blog post planner page for every month. I generally publish 7-8 posts per month. With this planner I can checkmark once I finish drafting my posts, publishing it, sharing on social media and responding to comments. Publishing new posts is the main moto of Blogging. Along with that, promoting every new post on social media, engaging with the blogging communities is equally important to take it to the readers. Here I can make sure every post that I publish is getting the right amount of exposure that it deserves. I explicitly created this page to keep track of my blogging expenses. We spend money on domains, hosting, plugins, online courses and it has to be accounted to have an eye on our expenses. 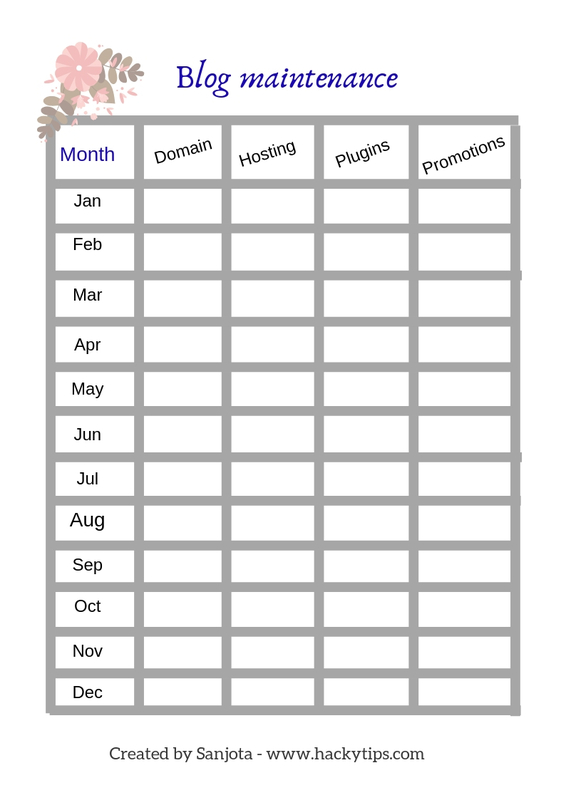 You can create one more page to keep track of your blog income. How much money you have earned from sponsored posts, guest posts, Adsense, affiliate links etc. Thus there are many useful pages which helps you to be in the track. Having a Blog planner aside is always like a reminder to complete the tasks. You can download the printable version of this Blog Planner for FREE. I have given a PDF file using which you can get prints easily. Once my design was completed, I checked for the options to get it printed. When I checked the charges by uploading my PDF file on Office Depot, it showed me $30! It again depends on what you choose. I selected full color, Glossy front cover, and a simple back cover for the hardcopy of my Blog Planner. After seeing the final price I dropped that option. At that price, I can get a whole new planner instead of designing it for 4 days. Finally, I took A4 size prints on my printer and trimmed the edges. Then took them to Office Depot to get a Front cover and spiral binding. It cost me around $6 including the printing price. Now I’m all excited to use my Blog planner and start the new year with a bang. Yes! I’m giving free download link where you can download the PDF version of my own designed Blog Planner. It has a total of 62 pages with bright colors on each page. This PDF file can be downloaded in A4 & A5 size. Since printing color pages is little pricy outside, it will be good if you have your own printer. You can design the final look however you want. 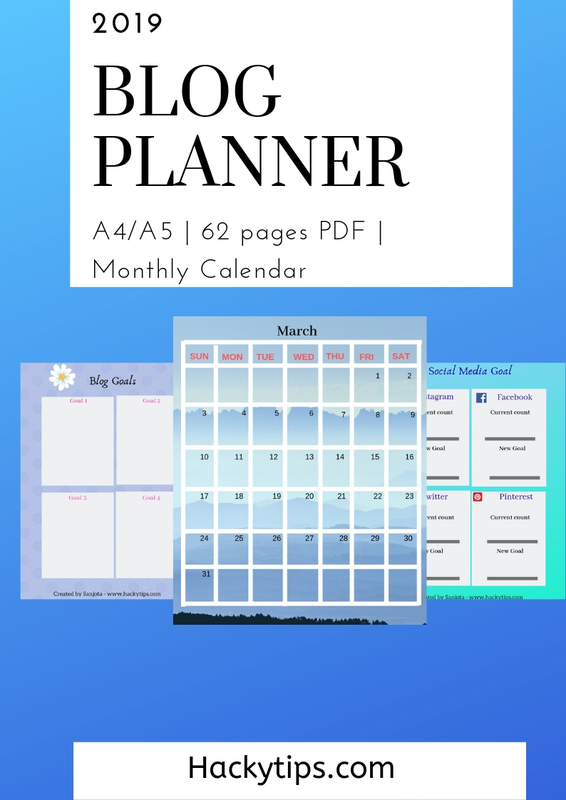 Please download the planner using the link below and let me know your opinion about it. Wow, that is an excellent one. 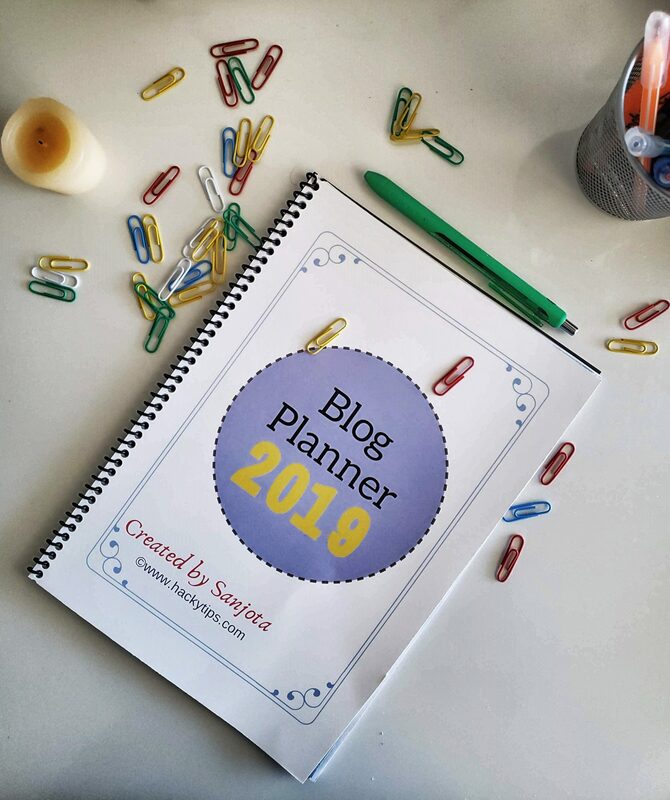 Appreciate your kindness in sharing the planner to thos blogging community!! It looks amazing. I can’t wait to print it. Thank you for creating it! Thank you for sharing this. I never thought of having a planner myself. Thanks for the nice plan you have shown us. You are welcome. Glad you liked it..
How very kind of you! What a great planner. I’m a bit late but I’m still going to download it… Thank you very much! Let me know your opinion. Thank you! Wow! thatg is a good idea and also great because someone else would be able to download and use it. It feel like it will be a little complicated for a guy like me , am really not a teach kind of person. Wonderful initiative buddy and sharing it free of cost with fellow bloggers showcases your humble and cheerful being. 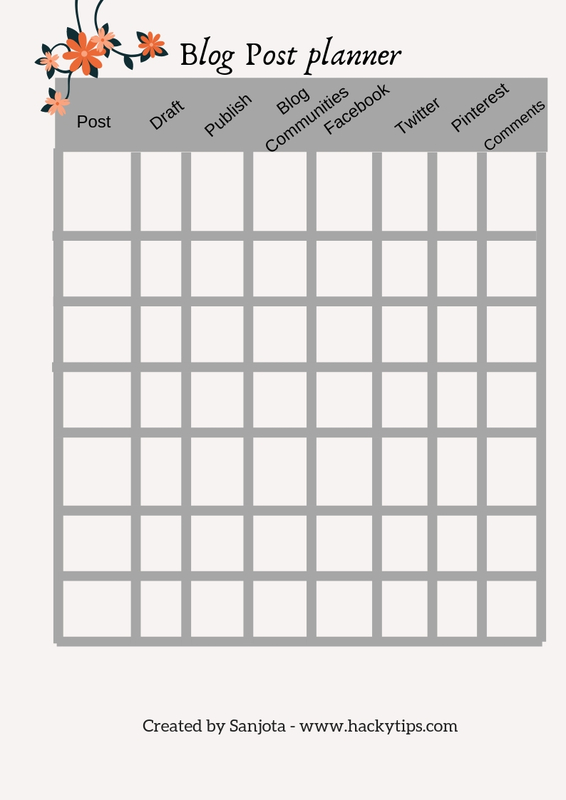 A blog planner seems like it would be incredibly productive. I will enjoy the download!